1, Material: tulle, elastic satin, lace, sation. 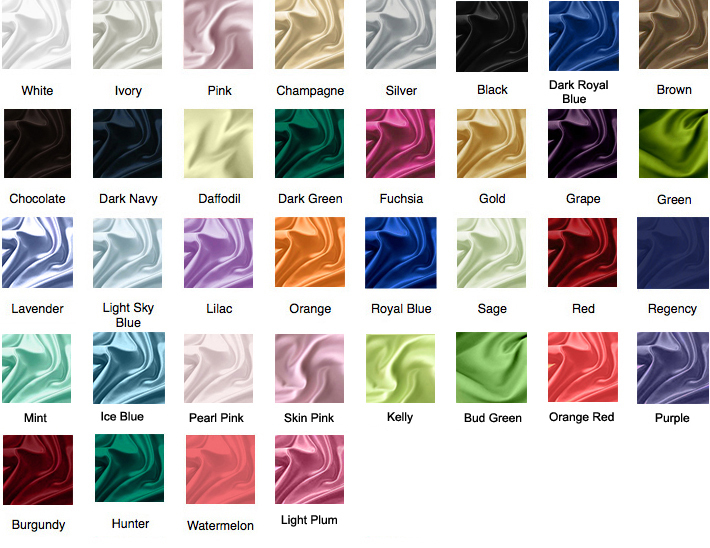 2, Color: picture color or other colors, there are 126 colors are available, please contact us for more colors, please ask for fabric swatch. Wrong Size, Wrong Colour, Wrong style, Damaged dress- 100% Refund or remake one or return 50% payment to you, you keep the dress. 2. Provide us with photos of the dress, to show evidence of damage or bad quality, this also applies for the size, or incorrect style and colour etc. Perfect-fitting Dress shows your Charming Figure! 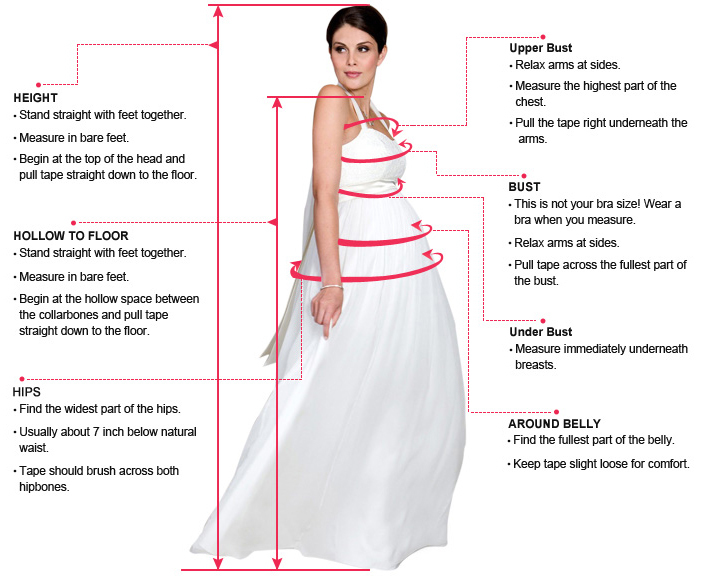 Perfect-fitting dress starts with correct measurements. Before custom-made your own dress, we recommend you to find a professional local tailor who can help you measure accurately. 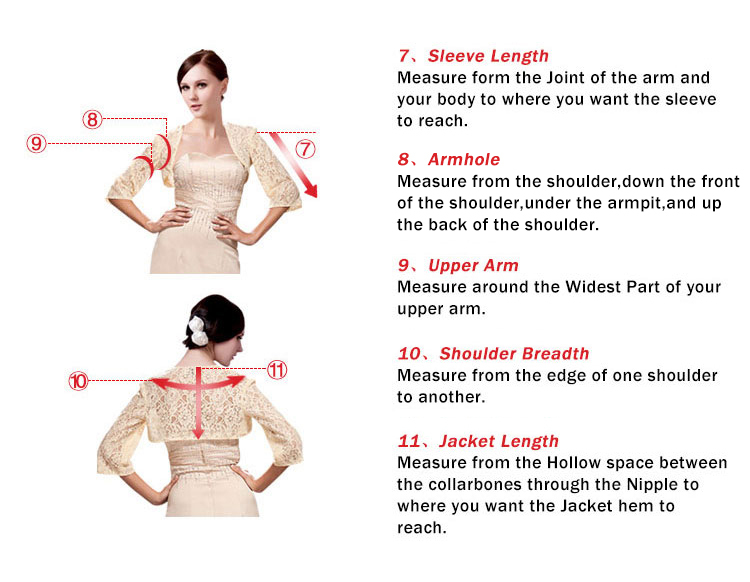 And, we need the measurements below and how to take them correctly. Please DO NOT measure yourself alone! Standard receiving time (Time you pay successfully) = Tailoring time (around 12-15 Calendar days) + Shipping time (around 3-8 Calendar days). To better communicate with you, please provide a valid email address and check emails after you have purchased for any updated information. Once you have placed your order you will be contacted by e-mail to confirm your order. If your billing address is a P.O. Box, then you must provide us with a physical address by email. Our freight is based on the different destination and package weight. If you need an accurate amount, please visit shopping cart and then enter your destination to get a shipping estimate. You can check your order information at this link. We have partnered with a number of reputable shipping companies for the destinations we service including DHL, TNT, UPS, FedEx, USPS and so on. Whenever the order dispatches, we will send you track number so you can follow the status. For the international order, you are assured to enjoy a fast and professional service due to our long-term partnerships with DHL, UPS, TNT, FedEx etc., therefore, even worldwide shipping and packaging to U.S, UK, Canada, Australia and so on, are safe without any damage because of those well-trained stuff. Copyright © 2019,Promdresses.me.uk. All Rights Reserved.